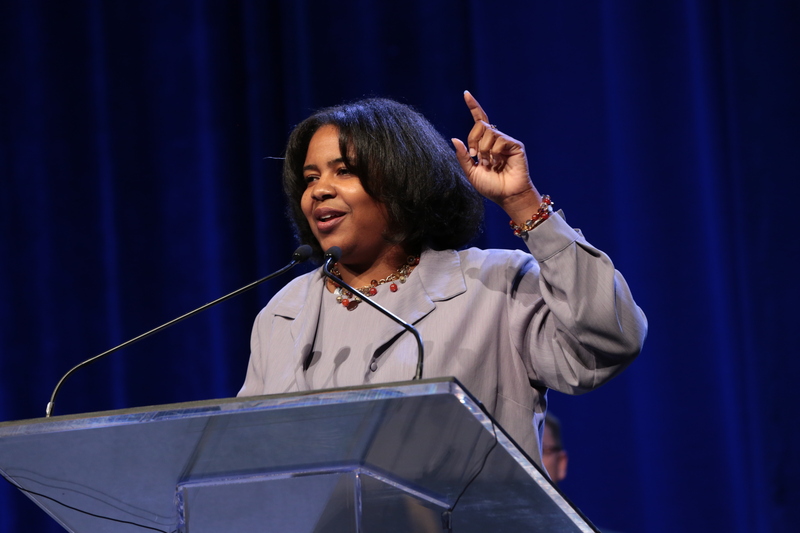 This change, said Jones, who serves as senior pastor of National Baptist Memorial Church in Washington, D.C., is something that describes her time in the role of CBF Moderator. Kasey Jones addresses the Assembly and ushers in a new CBF Moderator. Jones spoke to the changes in staffing, governance structure, branding and identity and even the move to a new office that has taken place within the Fellowship over the past year. Jones challenged Assembly attendees to look to the at the increase of violence in the country and around the world, to look at the changing social environment, and to look at what CBF has been able to accomplish. “We can take the testimony of how we’ve formed together and how we’re moving forward as a seed into our communities,” Jones said. “I believe in you. I believe in us. I believe that we have a place in renewing God’s world. And I am excited because there is one coming behind me who is a man of courage, who is a man of faith, who will take the reins and continue the motion forward,” she said introducing incoming CBF Moderator Matt Cook. Cook shared his dreams for the Fellowship, offering a reflection on the two disciples who walked the dusty road from Jerusalem to Emmaus on Passover weekend. “We know how the story ends, so it’s easy to forget or overlook how they must have felt as they left the city,” Cook said. “For centuries God’s people had been waiting for the Messiah to come and deliver hope, to provide them a future.” Speaking of Christ’s journey into the city of Jerusalem that was followed by his crucifixion, Cook challenged the Assembly to consider what believers felt before the resurrection. Cook suggested that the room of Cooperative Baptists might also understand this feeling, given the current social climate and cultural changes. At least we can agree on this, Cook said, that we find ourselves in a different religious context than we were born into or grew up with. 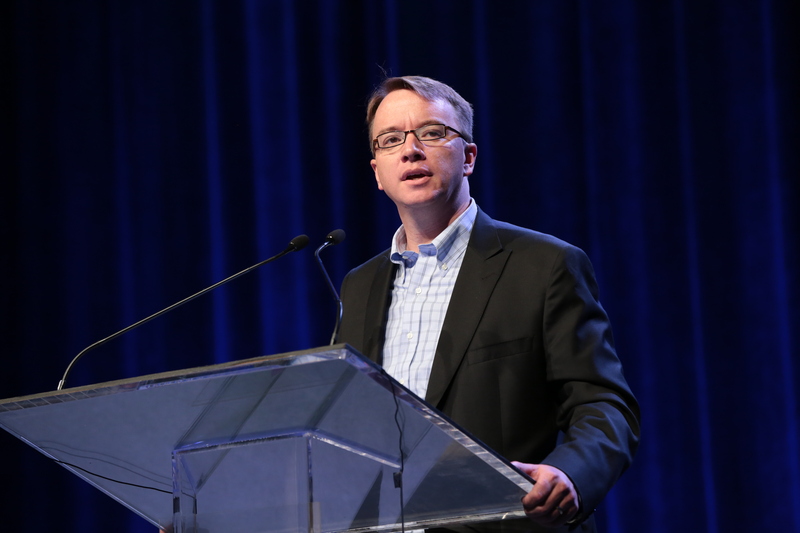 Matt Cook, incoming CBF Moderator for the 2015-16 year. “The church no longer controls the culture and the calendar. We are no longer the dominant voice in matters of public policy, and most importantly congregations across the country from nearly all denominations and religious traditions find themselves fighting an uphill battle for institutional vitality. Cook noted that until the disciples spent time in Jesus’ presence and in community, offering hospitality to others, they were blind to what was in front of them. During the final business session, the Assembly adopted the Governing Board’s proposed CBF missions and ministries budget of $12.4 million for the 2015-2016 fiscal year, which begins October 1. 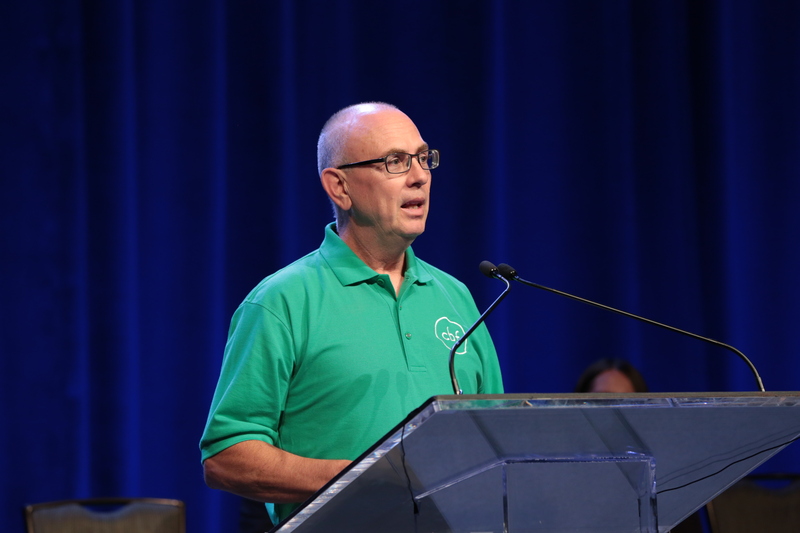 The Assembly also adopted the report of the CBF Nominating Committee to fill open slots on the Missions Council, Ministries Council and Governing Board, including the selection of Doug Dortch, senior minister of Mountain Brook Baptist Church in Birmingham, Ala., as CBF Moderator-Elect for the upcoming year. Attendees approved the Governing Board’s recommendations of new Nominating Committee members and a new Governing Board Recorder, Katie Sciba, who serves as a medical social worker in Stafford, Texas. Additionally, the Assembly affirmed new trustees of the boards of the CBF Foundation and CBF Church Benefits. Read the entire list of new members of the Fellowship’s governance bodies here. Dortch shared with the Assembly an update on the work of the CBF Governing Board. Dortch spoke about CBF’s rebranding process and its effort to clarify the Fellowship’s identity. The most important aspect of the Governing Board’s work this year, he said, was the development of a funding strategy that would create sustainability for CBF to fulfill its mission over the next five years. Through seven strategic actions, the Governing Board is moving toward a funding strategy “that would allow CBF to pursue a direction that would foster missional collaboration rather than competition for financial resources,” Dortch said. Alongside the CBF Missions Council, CBF field personnel, CBF state and regional organization leaders and the CBF Global Missions staff, the Governing Board has begun a strategic planning process through an ad hoc committee “to narrow CBF Global Missions focus in order to deepen our capacity and strengthen our impact,” Dortch said. Tennessee CBF Coordinator Terry Maples gave the report of the CBF Movement Leadership Team, a group comprised of the coordinators of the 18 autonomous state and regional organizations, CBF Global staff leaders as well as the CBF Moderator. The MLT gathers several times a year to promote effective communication throughout the Fellowship, cast vision and direction for CBF, share information and learn from one another. Terry Maples shares a report from the CBF Movement Leadership Team. “The [Movement Leadership Team] has been on a journey to clarify our purpose and to determine best ways to work together for the good of the whole Fellowship,” Maples said. Maples addressed the new purpose statement of the MLT, which centers around stewarding, strategizing, sharing and speaking. This new purpose has led to a “new day” for the MLT, he said, affirming that cooperation and collaboration have become high values for the team. “Suzii Paynter’s convictions about shared leadership and decision-making have led to many invitations for us to work toward a more seamless organization,” Maples said. CBF Executive Coordinator Suzii Paynter and Devita Parnell, who oversees the Fellowship’s Young Baptist initiatives, presented the Daniel and Earlene Vestal Scholarship to Corinne Causby, a student at Wake Forest University School of Divinity in Winston-Salem, N.C., and Jaime Fitzgerald, a student at Gardner-Webb School of Divinity in Boiling Springs, N.C. The scholarship, named in honor of former CBF Executive Coordinator Daniel Vestal, and his wife, Earlene, was initiated in 2011 to support the Fellowship’s continued emphasis on theological education and the local congregation. “The Vestal Scholarship goes to support those students who demonstrate a commitment to congregational ministry and who have excelled in their theological studies,” Parnell said. “This award is given in the spirit of their love and joy,” Paynter said of the Vestals, offering personal words of affirmation and congratulations to the 2015 scholarship recipients.